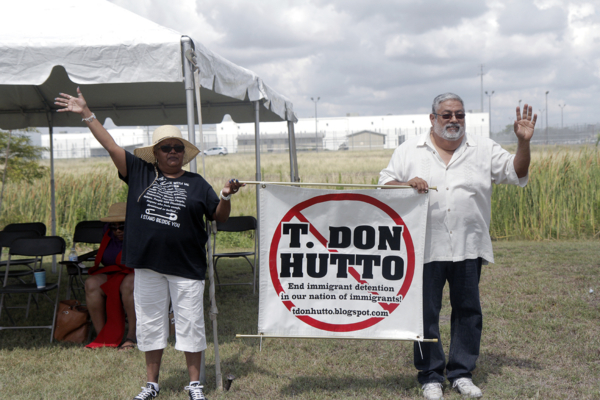 [Episcopal News Service – Taylor, Texas] A thousand Episcopalians, at least two for every one female incarcerated at the Hutto Detention Facility in rural Texas, stood under the blistering sun July 8 in public witness to the actions of the U.S. government in its enforcement of immigration policies that have separated families over the last couple of months and have led to roundups of migrants and deportations. “We do not come in hatred, we do not come in bigotry, we do not come to put anybody down, we come to lift everybody up. 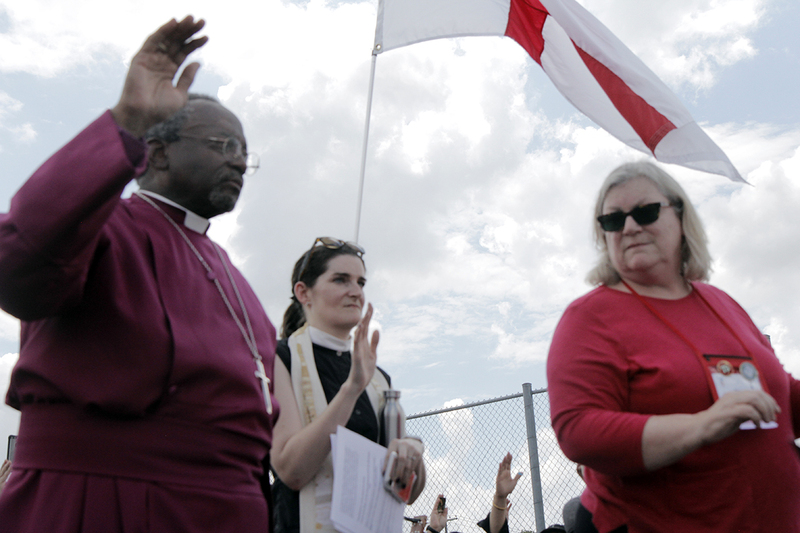 We come in love, we come in love because we follow Jesus and Jesus taught us love,” said Presiding Bishop Michael Curry, in his sermon during the noontime Prayer of Vision, Witness and Justice held in sight of the Hutto Detention Facility here. “We come in love,” he said. An ad hoc planning team lead by the Rev. Winnie Varghese, director of justice and reconciliation at Trinity Church Wall Street, and the Meghan Castellan, rector of St. John’s Episcopal Church in Ithaca, New York, organized the prayer service in partnership with Grassroots Leadership, an Austin-based nonprofit organization that works for a more just society by challenging the for-profit prison system, mass incarceration and deportation and criminalization of migrants. 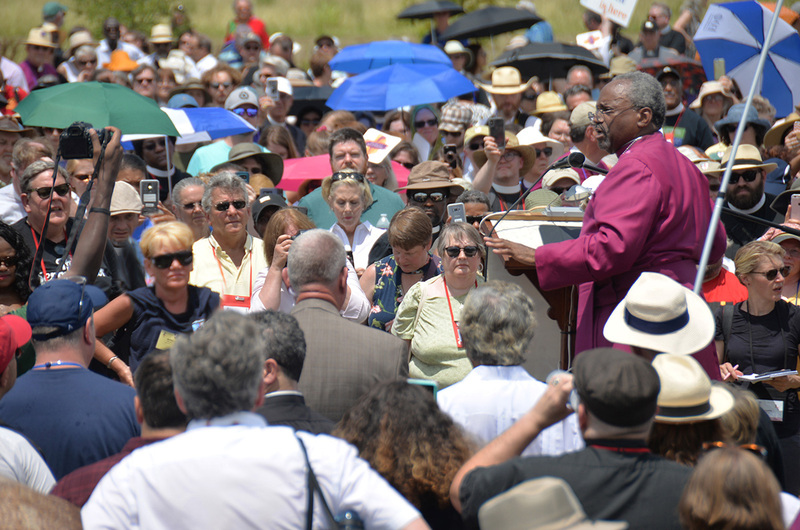 The Episcopal Church’s 79th General Convention is underway in Austin through July 13. The U.S. immigration debate and the Trump administration’s zero-tolerance policy loomed large the previous day in a joint legislative committee hearing, where some 25 people testified on issues ranging from providing sanctuary to immigrants facing deportation, condemning the separation of migrant families, supporting Haitians who are poised to face deportation and calling for legislation to give permanent legal status to the dreamers through federal legislation known as the DREAM Act. 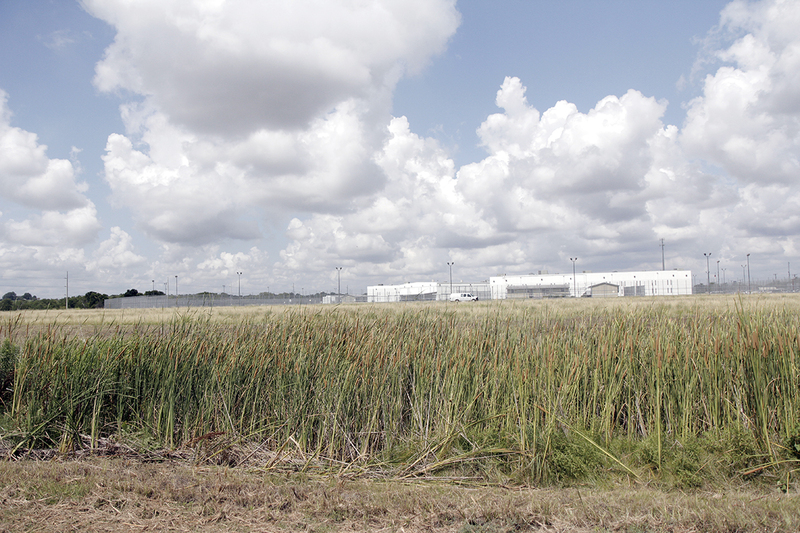 The House of Bishops and the House of Deputies delayed by one hour the start of their July 8 legislative sessions so that the presiding officers and more than 1,000 Episcopalians transported by 19 buses could attend the prayer near the privately operated detention center, housing 500 females in rural Texas about 40 minutes’ drive from Austin. Standing just outside the detention center’s chain-link fence, Taylor community members Jose Orta and Audrey Amos McGreenee held a sign to T. Don Hutton reading “End immigration detention in our nation of immigrants.” In 2006, the prison was converted from a medium-security prison to a family detention center, and then in 2009 to an all-women for-profit detention center, housing migrant women, some having been separated from their children, Orta said in an interview with Episcopal News Service. Although there long have been issues with the broken U.S. immigration system, the announcement in April that the Trump administration would begin criminally prosecuting migrants and separating children from their parents while they undergo deportation hearings has called American citizens to advocate for family unification and reunification. In some cases, it has been a call to advocate for just policies at the national level. In other cases it has meant taking to the streets and bearing prayerful witness, as Episcopalians did outside Hutto. “I think, frankly, what we’re doing, we’re expressing what most Americans feel. We are horrified by the current state of things. I think most of us cannot image how we can make it visible. I think we are afraid to talk our neighbors, we are afraid our friends disagree with us, we are afraid to cause insult. So when we started to do this, we thought we’d get 150, 200 people. We have more than 1,000 just on the buses,” said Varghese, who is also a deputy representing the Diocese of New York. 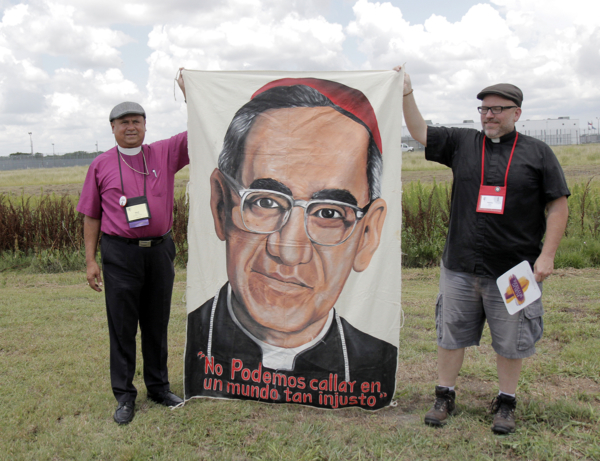 Immigration in the United States, as in other countries, is disorganized, said El Salvador Bishop David Alvarado, in an interview with ENS following the prayer of witness. “To be a migrant,” he said, is treated like a crime. When in reality, migrants are fleeing violence, they are looking not only for opportunity but also for refuge and salvation. In Central America’s Northern Triangle Countries – El Salvador, Guatemala and Honduras – people are fleeing social conflict. “It’s affecting many people; there’s a lot of forced displacement,” said Alvarado, adding that between 60 and 70 people flee El Salvador daily, some of them staying in Guatemala and Mexico and others making their way to the U.S. border. As the prayer was happening, an 11-member Salvadorian family was trying to cross the border and one of the family members was texting its status to Elmer Romero, a Salvadoran-born member of Trinity Episcopal Church in Houston and a board member of Cristosal, a human-rights organization providing assistance to Central Americans who have been forcibly displaced by violence. Cristosal began more than a decade ago as an Episcopal ministry. 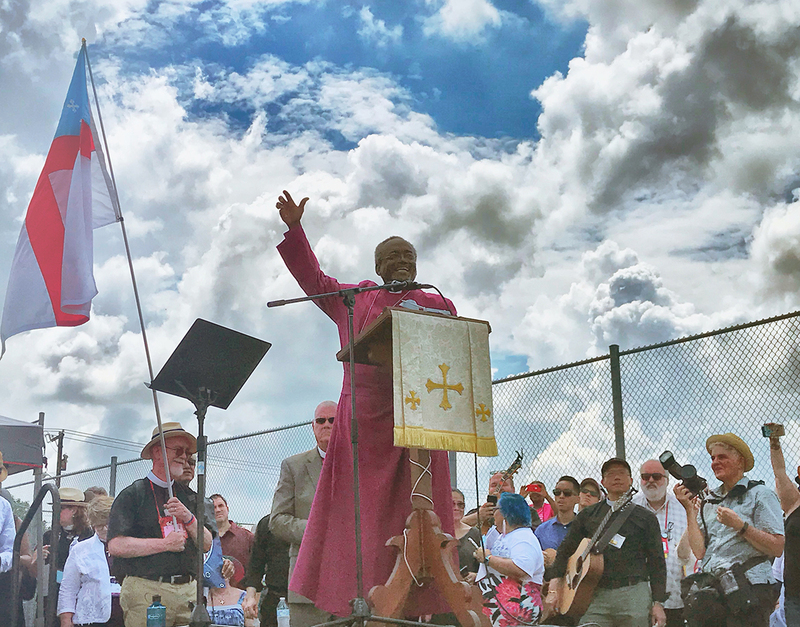 During the Prayers of the People, Texas Assistant Bishop Hector Monterosso and Central New York Bishop De De Duncan-Probe, prayed for the termination of violence, poverty and displacement and for leaders to implement policies that both protect national security and that lead to safe migration, the end of detention for asylum seekers. They prayed for children separated from parents and parents separated from children. “Today is my son’s birthday, and if he had ever been taken from me, I don’t know what I would have done … just because I was trying to bring him somewhere where he could have liberty, where he could have a life,” said Sandra Montes, a music director from the Diocese of Texas who led music at the prayer and sang the day before at the July 7 revival. In a Twitter post following the prayer service, Grassroots Leadership posted that the women in the prison were crying, just knowing they are not alone. Not leaving anyone alone is at the core of loving one’s neighbor and following Jesus’ teachings, Curry said. “Jesus said ‘love God and love your neighbor.’ We come in love, that is the core of our faith, that is the heart of it,” said Curry. “The way of love calls for us to be humanitarian, it calls for us to care for those who have no one to care for them, and we come because we don’t believe that a great nation like this one separates children from their families. -Lynette Wilson is a reporter and managing editor of Episcopal News Service.